Buying a used car can be scary because you don’t know its history. 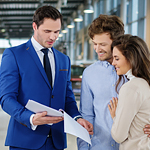 At Wine Automotive, we have a vehicle history report (VHR) on every used vehicle, ensuring you know more about the vehicle. This makes it easier to avoid problem vehicles while also enjoying a greater level of peace of mind. Mirrors with this feature are equipped with specially designed ambient light sensors that work to detect glare from headlights. The electrochromic gel is then used to communicate and send the appropriate charge. This process then reduces the amount of light that the oncoming vehicle is able to reflect onto the driver's face.